While much of the attention in the Tacx booth today at Eurobike was on the soon to ship Tacx Neo Smart Bike, there was also a lonely trainer swirling around quietly in the corner – the new Tacx Flux 2 Smart. This unit squeaked just in time to the show to be able to be put up on a pedestal (literally) – but wasn’t yet in riding condition. Still, it’s worthwhile taking a look at the specs and seeing where they stand compared to the other mid-range entrants that are on the scene. 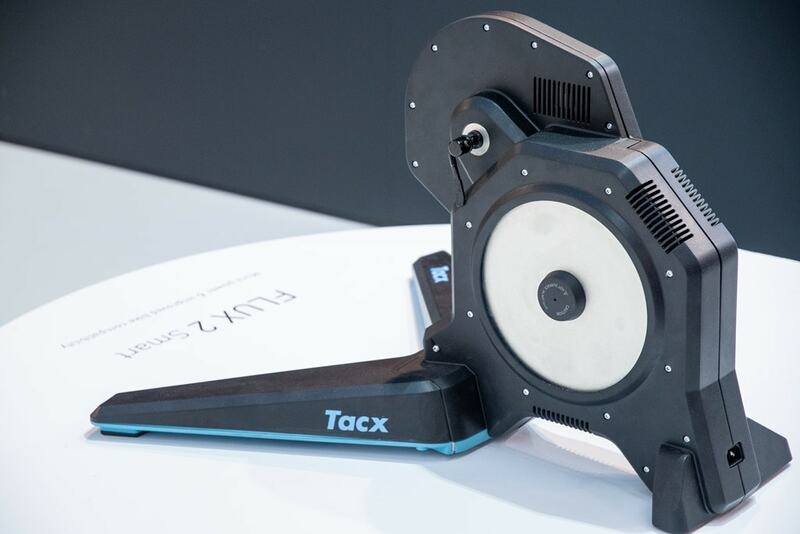 After all, it was just a few weeks ago that Tacx reduced the price of the original Tacx Flux from $899 down to $799. Meanwhile, this new Flux slots right in place price-wise where the original unit left off – resuming the $899 spot. A spot that is mirrored by Wahoo’s latest entrant today, the KICKR CORE as well as Elite’s Direto trainer – all of which are direct drive trainers. As I said up above, there wasn’t an opportunity to ride the unit yet – so the jury is still out on that. And even that aside, the reality is this is a very minor evolutionary update of the Tacx Flux trainer, rather than some huge shift. And that makes sense given how deep the Tacx lineup is in terms of numerous models (I’d argue, probably too many models – almost like Elite was years ago). They’re having to be careful to not step on the toes of other units. Some of these aren’t necessarily box-listed stats like change to accuracy (+/- less than 3% still the same), nor crazy things like 24% incline. But in reality, the changes made here are actually probably more important. Take for example the speed change for maintaining 15% grade. That’s actually much bigger than folks realize. See, the deep dark secret with trainers is twofold. Part of it is that Zwift by default halves the trainer difficulty level. So when you see 8% grade, its actually only giving you 4% grade and then virtually slowing your speed down. Why does it do this? That’s the second part: Most trainers aren’t really designed to handle very low speeds at high gradients. So the mid-range trainers and lower end trainers especially suffer here, and can’t hold the inclines they say at the lower speeds. For example, the Flux 1 can technically hold 15% grade…but only if you were going 50KPH. Which of course nobody is doing. So bringing that entire range down to 10KPH is a massive shift. That’s a realistic value, and thus you can realistically make that work at 100% trainer difficulty (versus the default halved value on Zwift). Likewise, the shift to the trainer resistance floor is useful for smaller athletes that may have lower FTP values. Meaning, they’re putting out less wattages. Previously they’d have to find a gearing combination that allowed them to go to lower watts during the recovery portion of intervals. But sometimes doing that meant that the trainers didn’t react as fast. So it was a double-edged sword. This lowers that ‘resistance floor’ as it’s known significantly. In talking with Tacx they showed charts of how they’re starting to re-architect their trainers a bit to focus more on the specific zones people are actually riding in, rather than going for mythical 24% at 50KPH type specs. I’ll be digging into this a bit more, as they’ve produced some pretty interesting data sets and assumptions about where people are actually training. But stay tuned for that more down the road as I’d like to make it more about industry trends than just what Tacx is doing. Ultimately, as I said above, the changes here on the Flux 2 may appear minor (especially cause it looks almost identical), but are kinda like the shift from the KICKR 2017 to KICKR 2018 – behind the scenes impact of those changes is actually quite important. 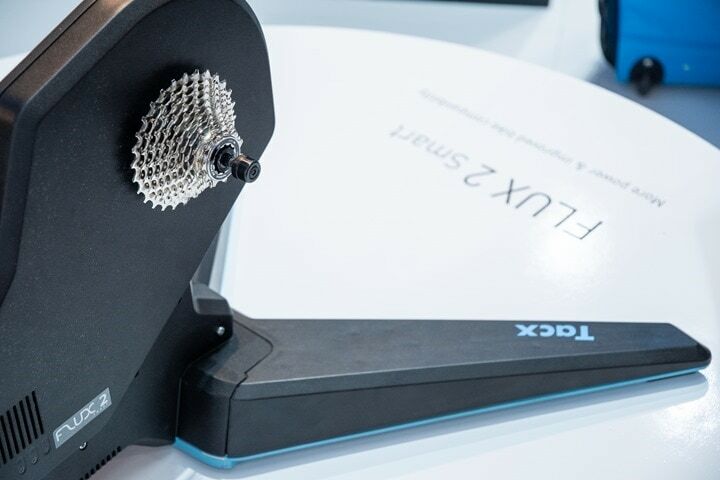 In the case of Tacx with the Flux 2 it makes the trainer highly appealing to those focused on climbing, or in the case of Wahoo’s KICKR changes it makes it appealing for those that appreciate their hearing. But that’s a whole different topic. Of course, there’s plenty of history with the Flux lineup. It got off to a very rough start with the first generation units for the first few months suffering all sorts of manufacturing QA problems. Tacx eventually sorted those issues out and since then the Flux has found smooth sailing and plenty of popularity. Still, there’s a pile of testing that I’ll be looking forward to digging into once I get my hands on a rideable unit. At the show, the only thing rideable about the Flux 2 shown there was the turntable it sat on. 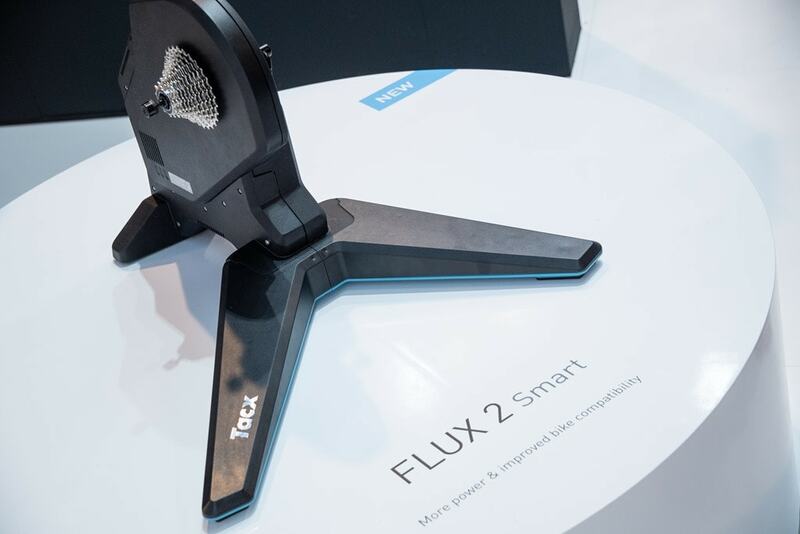 It sounds like Tacx will be releasing the Flux 2 in low volumes from September, and then at full volume from October. That’s a bit late in the trainer season curve, even assuming there’s no delays or the like. Hopefully they can keep things on the straight and narrow. Either way – between the new KICKR CORE and the Tacx Flux 2, alongside the Elite Direto – it’s shaping up to be a really strong year at the $899 price point. Let the battles begin! I wonder what’s the noise situation like with the new model. They’re saying the same as previous Flux (thus, so-so). The unit on the show floor unfortunately wasn’t rideable. Most of that you saw inline within the Flux 1 manufacturing over the course of time, especially in that first year. I’ve heard essentially zero complaints in the last 8-12 months from folks on the Flux 1. I have just received Flux #3. It was built in the past few weeks apparently. First 10km was nice and silent and now a sound is starting to come from the unit. I’m going to give it a bit more time to see if it settles but these units are still far from being fault free. I had two Flux since september 2017 and decided to go for a Neo due to problems with the Flux. Worst experience ever in terms of product and customers service. In a Flux x Direto x Kickr Core, my problem with the Flux is that it does not fold for storage. The Direto is just too noisy for the apartment. These are both eliminators for me personally. I think Wahoo will have a great success on the hands with the Core if there’s no flagrant fault with it. Agree. The fact that the Core is silent is the knife. I agree with you, that the Direto is noisy. But he is only in high gears with a fast spinning flywheel noisy. I use the direto only for interval-training and i always use the lowest gear and have no complaints from my neighbours. Yea, I too have been concerned with the quality control of the Flux. Check the Amazon reviews as well, really terrible. I love Ray’s reviews, but they are N=1 and are not indicative necessarily of overall failure rates… do your due diligence before dropping your money imo. I found Flux 1 prices dropped as low as 550 Euro, and thought all early problems solved. Reading comments above, I started thinking I better go with Direto for 610 Euro. The 15% @ 10kph is a big thing for me. How does this compare to the Neo, is it even better in this respect? Would also love to have a direct comparison of the main contenders (wahoo kickr, Tacx neo, etc.) on this specific topic. I do train for mountainbike and am very often confronted to high slopes which require high power at very low speeds (~350W / 6kph / 80rpm). Is there anywere to look for such documentation (max power vs speed) ? Yup, on the near-term docket for sure. Yup, that’s exactly what I’m working on (with multiple companies). It’s a bit trickier than folks want to make it seem, to ensure you can correctly compare against multiple companies/trainers. But that’s the idea, and all the trainer companies I’ve talked to it are down for it. Hi Rey, How does this compare to the Elite Directo? In Directo, i will not be able to have the 100% realistic feel on Zwift simulate a 14% ascend? What does the spin down consist of for this trainer? My old man has a Neo, and the lack of spin down required is amazing. I’ve got an entry level Tacx Flow Smart T2240 (and a power meter fortunately) and the spin down requires me to warm the bike (tire) up, then use the app to ride to 30kph (?) and stop pedalling, then I have to tighten or loosen the resistance on the tire to match up with a green line on the app. Do you have to fiddle with a dial or anything on this when calibrating? Or is is something like a back pedal akin to Power pedals, or Zero offset with a Crank PM? If it’s anything the same as the Flux 1 (which I would expect!) then it’s very similar to your experience with the Flow Smart (and my old Vortex Smart) but doesn’t require any ‘wheel tightening’. You basically pedal up to speed and then spindown, the offset result is then automatically set/applied by the trainer. Just to expand and rather than start another comment – Flux 1 owner here since February. Lots of initial accuracy issues which seem to settle down over the first few hundred miles on Zwift. Still not totally happy with it’s accuracy during high power sprints/kicks and the noise but with the hassle of sending it back (again!) I’ve stuck with it. Wish I’d bought a Direto! Now KICKR Core seems another very valid alternative. When using a power meter as power source, the spin down is not necessary. I just occasionally do spin downs on my wheel-on trainer since i have a power meter. I still keep the tyre-pressure constant to preserve the road-feel and responsiveness, but for smaller deviations of the set incline i don’t care because i have to use less than 100% trainer difficulty on Zwift anyway to avoid slipping at steep sections. Will all these new trainers handle a bike with disc brakes? My Kickr2 does not. I’ll be replacing it later this year and want to be sure I don’t get a new trainer that does not handle all my bikes. So I guess as long as you’ve got one of those standards, then you should be ok.
Axle standards and clearance for disc brake calipers are very different things. Will you do a vlog about Eurobike on your YouTube channel? Sorta. I’ll do my annual walk-through of the DCR Eurobike RV (cause that’s fun for me to look back on). Then I’ll also do something down on the Stelvio with what tech I’m using (like last year I did in the Swiss Alps). But mostly I’ve been doing videos on all sorts of specific Eurobike Tech. Oh, and I’ve actually got a pre-Eurobike Behind the Scenes VLOG I shot that shows what it’s like at the DCR Cave as all the new stuff comes in. I’ll release that later this week. It’s a one-shot-wonder. I’m in the run for a new trainer for coming winter (still have the older Bushido (not so) smart). Until I can ride a Flux 2 (probably not till August it sounds like), it’s really hard to say. We asked that. Tacx has seen no aspect of it’s biz impacted by it. Most other companies in the space have had no impact either, and even Stages’s impact is very minimal as only a single SKU and even then the way the tariff is it’s not 25% of the retail price, but rather the component price. So mostly negligible. Still, most companies we talked to are shifting manuf out of China (and were doing it already, largely for non-presidential reasons). Companies are going to Vietnam and Singapore, with a side of Taipei. Interesting stuff about the high wattages/grades at lower speed. Did not know about this. How does this compare to the new Kickr(core) and old 2017 Kickr specs? Was it lacking too in that area? No news about the NEO? Would like to see at least a handle for better portability. Heck, it’s the only trainer that can be used outdoors without power, but it’s so cumbersome. Not sure if anyone is still tracking such things but my Tacx Flux bought in late April 2018 was defective, I am going through all sorts of rigmarole to get it exchanged. Tacx (from Holland) have diagnosed it as requiring replacement but naturally the local bike shop in Australia says we won’t take Tacx’s word for it, we have to send it to our distributor who will eventually do something about it. Just hopeless, I don’t see how they’ve really lifted their game at all and would not trust a Flux 2 either. My experience replacing 2 Fluxes has been quite different. I email my LBS with a video of the noise and ask for a replacement. They forward email to their Tacx rep who arranges the replacement. I get the call its arrived so I take old one in and swap it for the new one. That’s how it should work IMO. At least that’s how it works in NZ. That’s quite good! I had to really twist the arm of the store today, even with the Australian distributor saying in writing ‘we will provide you a new unit within 3 days’ they were reluctant. I was quite sympathetic to their predicament but when they had Tacx proper and the local distributor (Sheppard Cycles) saying ‘replace it’ their attitude needed to change..
I’m interested in your comments about the shift to the trainer resistance floor, since I’m one of those smaller riders. But I’m no sure I’ve understood. Could you please elaborate a bit on that? It would be great if you could (maybe you already are) work with TrainerRoad (I’m making the assumption that TrainerRoad has a pretty large user base that would provide a solid sample) to get data from them on actual wattage / speeds that people are using for indoor workouts, and then us that for evaluating trainer performance. Can you control the FLUX 2 with a WAHOO BOLT as control unit? Fe. changing/increasing or decreasing wattage on the BOLT, changing it also on the FLUX? Shouldn’t easily measurable max torque in Nm being used to compare trainers instead of some mythical grade % ? We can discuss how to ‘correctly’ convert Nm to % for an end user. But when directly comparing trainer to trainer Nm should instantly tell which one is better at ‘grade simulation’. Totally agree, at the very least all trainer companies need to agree to advertise max % grade at the same speed for the same weight. Seen posts above – any advice as im looking for my first trainer. Tacx Flux v1 new is now £525, do I get that or wait and and get the core for £699? Callum, I would be waiting for the Flux 2 or the Core. Don’t touch the v1 Flux. I am in the process of returning my 3rd Flux due to failure. I like the look of the Flux over the Core but maybe the Core is better tech.-wise? Cheers, think I will wait for the flux 2 vs core reviews to come out! Is there just one model of the new Flux, my local bike shop (Tacx stockist) informed me that there will be a Flux 2 & Flux S models available? Where can you find information on other Turbos about what speed you need to maintain to achieve a certain gradient? It sounds like early October at the earliest. Despite mentioned info above it does not have all axel adapters in box! If you are in the trainer market for a new direct drive trainer (sub €800,-): which would you recommend at this moment for the comming winter? or hold your money and wait a bit for the Tacx Flux 2 review and decide then? I can wait a bit, but want to have a new one before the winter. In that scenario, it really just depends on how much you care about sound. If that doesn’t bother you (or if you have a loud fan), you could save the 250EUR and pickup the Flux 1 and likely be happy. I would note that if you’re a bit heavier (like solidly 00kg+) and like riding hills a lot, then you might want to look to the CORE instead. But if you’re lighter than that you’d never have an issue. The CORE will give you a bit more inertia, but again, I suspect most people wouldn’t care a ton if they could spend 250EUR on some other gizmo or gadget. Heck, that buys a new Wahoo BOLT or Garmin Edge 520 (maybe even 520 Plus) these days. As for waiting for a Flux 2 review, i suspect that’s going to be a while. Like, late October or November at the earliest by the sounds of it. Firstly, thanks for awesome blog and reviews! Any news when you would review Tacx Flux 2? Once I have a unit. That was supposed to happen this past week, but hasn’t quite yet. Right now for new trainers coming in, I’m on about a 7-14 day cycle once they hit my doorstep. Is Wahoo doing the same thing with their Core trainer as Tacx is with the Flux 2 by lowering the power to sustain a 15% grade? Not sure entirely. The power required is very similiar to that of the KICKR 2017 though, which one doesn’t really hear much complaints in terms of trainer floor or weight ratios. Hi I can get the version 1 trainer for £405 approx $525 on a deal is it worth the money or should I just wait for the new version to be available. I will use the trainer for sufferfest or Zwift, not sure which at the moment. Looks like they have changed the Flux 2 into the Flux S. They’ve lowered the price point even more but also downgraded the max power and slope settings. I’m sure DCR will be releasing and update/review soon. Only adding a 12mm thru-axle adapter, just when 10mm becomes the norm for road bikes with disc brakes. That seems a bit backwards looking. Tacx advertises the Flux 2 as being “the most silent flywheel equipped trainer available.” True or false? I don’t see how that could be accurate. I wouldn’t/don’t classify it as such. Can you offer a preliminary recommendation Kickr Core versus Flux 2? I haven’t ridden a Flux 2 (even for 2 seconds), so it’s hard to say. But spec-wise I don’t think it’s any better than the CORE, and more importantly for some, it’s not silent like the CORE. are you able to give some more details about the difference between the Flux 2 and the Flux S regarding the resistance floor? I have a Flux S and this trainer isn’t able to control 80W with a gear ration of 50/23. Is the Flux 2 able to control this? Do you have any experience if the Wahoo Core is able to control this scenario? Well, it’s now the end of December 2018 and still no Flux 2’s in any retailers (uk) and not one proper review online? Anyone know what’s happening. Actually, some did apparently ship. A DCR reader or two commented they had received units. They were within Europe, but I don’t know which side of the Channel. Hoorah, they’ve arrived in Aberdeen. Ordered from my LBS! I just bought a Tacx Flux 2 and connected this trainer with my Forerunner 935 and my Edge 820. In both cases as a cadence/ speed sensor (and not as trainer on the Edge). The Edge works fine, but on the FR 935 I have countless speed drop outs. It’s like an on/off signal every half second. The strange thing is, that this happens also on the FR 935 of my girlfriend. And it’s also strange that both FR works without any problem if they are connected in the same way with my Tacx Neo. – If the problem is the Tacx Flux 2  why it works fine with the Edge 820? – If the problem is the FR 935  why it works fine with the Tacx Neo? Has anybody an idea or had the same speed drop outs? I know the Flux 2 has been slower to ship, but have you had a chance to test this unit yet? I know it compares to the Kickr Core, but given the ESD and noise issues (I know it is limited to approx 3% of trainers) I have been waiting to pull the trigger on either the Core or Flux 2. When will we see a legitimate review? I want to get a few more rides in it though before a full review. Nothing wrong with it per se, but I still think it’s a really tough sell against the KICKR CORE (putting aside any Wahoo issues for the sake of this argument). Mind you share some of your firts insights on how or why this Flux 2 may be “inferior” to the Kickr Core (putting apart production issues). The specs seems quite aligned between those devices. On which points the Kickr Core may be better? A) Noise: True to past Flux lineage, the Flux 2 sounds like a gravel grinder. The CORE (assuming it’s not broke) is silent. B) Road feel: Having been riding the NEO, Hammer, and KICKR’s mostly throughout the fall (which are all in the same ballpark), I forgot how much a step down this is. D) The resistance is stronger than past Fluxes for sure, but I don’t see it as better than the CORE. I have just purchased a Flux 2 (7/03/19) and waiting on delivery. I have a two year old Kickr Snap and use it regularly. It has been nothing short of a torment to me and the service by Wahoo has been shocking. The until could not function with Zwift, which was the reason I purchased it for in the first place. It kept dropping power circa 15/20 min into a session so you ended up spinning like a hamster with at 100w. I hope the Flux 2 provides a better more dependable experience. I’ve purchased and received the Tacx Flux 2. It’s my first trainer but happy with it so far. The only problem so far I’ve found is sometimes the trainer puts too much resistance in suddenly on a hill almost bring you to a holt while you grind rapidly down the cassette to compensate! The trainer is super quite in my opinion. I’m running this trainer as stock from the shop without playing with any settings on zwift…..
Will your review of the Flux 2 be online soon? Hi Dave, picked up the flux on Friday last (15/03/19). Unpacked it Saturday. I’m not mechanically minded so fitting the cassette was troublesome. Also keep in mind you will need to know how to adjust the back derailer to make a smooth gear transition. I failed to achieve as I just don’t know what to do. So if you are unclear on this stuff, buy from a local distributor, take the bike in and get them to fit everything. On this point the Wahoo Kickr wins hands down. Set up with Zwift was a breeze. One point here yo remember is that it seems there is no need to calibrate the flux. This takes it back to factory settings. At this point there is definitely something up with the calibration / resistance. I have been training at FTP of 254w. Pretty poor I know but that’s life…we all can’t be a pro. Anyway, I have tried using it with Zwift through an ANT + sensor and while I’m connected the resistance when I set an FTP of 254w is impossible to spin the week. I have to stand to lush the pedal down. This is not a good start! I have tried it connected to a Garmin when not connected to Zwift and I have always closed down the Zwift app before switching to Garmin. Result was exactly the same in either case. The acid test: I emailed Tacx yesterday 17.03.19 and await a response. I’ll let you know. For now….back to the Kickr as this works fine with my garmin. It never worked with Zwift through windows or Mac. Yeah, I had one planned a few weeks ago until things went sideways for me as I analyzed data in ERG Mode (TrainerRoad/Zwift) and some some large inaccuracy issues. Not seen in other modes. I went back to Tacx to see if they could replicate and it’s been a bit of a slow volley since. However, on Friday they confirmed they could indeed replicate it, and it sounds like it impacts everyone in ERG mode (~10% is what I was seeing across all power ranges). They’re working to figure out how to fix it. I’ve honestly been too busy with other time-sensitive reviews to have urgency to push this out. However, I shot back a note a few minutes ago asking clarity on the timelines. At this point it’s three months in and people have trainers out there with inaccurate data on them. Next week appears to be quiet on my posting schedule, so I suspect one way or another it’ll go out then. Typo prone as evident in my last message, big fingers small keyboard! I recurved a reply from Tacx this morning suggesting I do a session using their tacx training app. I’ll stay that next weekend as I will use the Kickr snap during the week as I can use this with my Garmin to pick up power, cadence etc. All this stuff takes time and disappointing start. Once I have the flux working I will return my Kickr snap to Wahoo for their people to sort. No refund offered even though I have more emails exchanged with them than imaginable. Would you advise purchasing a Flux 2 given the accuracy issues that you mentioned earlier? Have this been resolved? I tried to google anything about it and it seems there is almost no information in the internet about Flux 2.. I am currently hesitating whether to choose a Tacx Flux 2 or KICKR Core as a second trainer, for my wife. Myself I have a Neo 2 and it “seems natural” to stick to one manufacturer and go Tacx all the way (e.g. purchase the Flux 2). Also, how does KICKR Core compare to Flux 2 in terms of “low resistance floor”? My wife is quite small and light and technically Flux 2 is more suitable… or isn’t it? 1) You really do need to be able to set up the sprocket on the Flux 2. If you are not mechanically minded there is nothing worse than the sound of a slight grating noise and gears not settling in. 2) Once up and running and when connected to Zwift it worked but….the resistance was way off. I’m a pure amateur and turn out an FTP of 274w. I couldn’t even turn the pedal as the resistance was too high. Can you please run a short test with your trainer in the Tacx Training app? The Tacx Training app can be installed on your smartphone or tablet. Here you can connect your trainer and start a training. Please check if the same issue also occurs on this application. I haven’t had time to go at the switch over from the Kickr since then and planned to do it last weekend but went cycling instead! Interestingly, the kickr works very well with my garmins. I have a 510, 520 and recently purchased the new 1000 (or whatever the name is – some piece of kit). I think the issue is that the Kickr cannot work with an ant sensor connected to a laptop and it certainly cannot connect to both an ant and Garmin device at the same time. Although I tried the Kickr with my Ipad also and the very same issues arose. 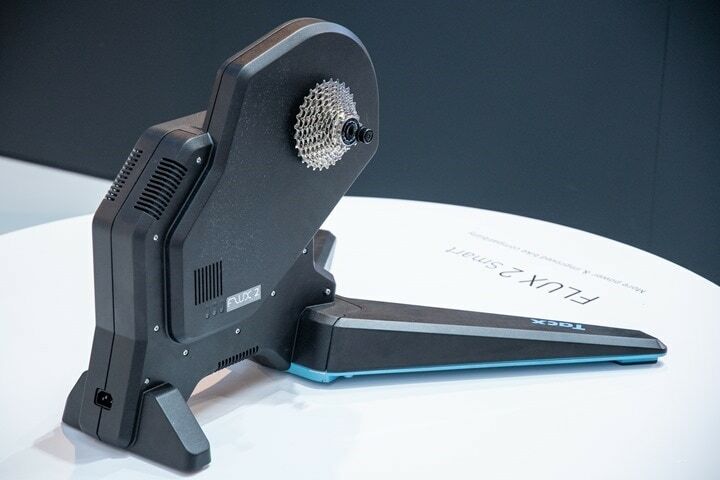 To confirm the issues I had and still have is that within 20 minutes of connecting it to software such as Zwift, Sufferfest, Trainer Road it looses the power resistance and you end up spinning like a hamster. It can take two weeks to get it back in order through constant trial and error an if you are like me, I don’t have the time for that nonsense. 4) On first impressions the flux is as sturdy as the Kickr and and the fact that it connected to Zwift with ease impresses me. My plan is to get it sorted this weekend but frankly the jury is out…stick to what you know perhaps! I am ok with mechanics and have no problems installing a cassette or adjusting gears. As said, I have Neo 2 which also required cassette installation. I also used to have a Wheel-on trainer (Tacx Bushido Smart) that I am now selling as I have switched to Direct Drive. 1. Is the Flux 2 accuracy problem still a problem? 2. Flux 2 is supposed to have much lower resistance floor. How does Kickr CORE compare to that? You seem to have answered the question 1. Unless Ray has some (un)official information to add.